So let’s place the start of the day, last Saturday, at noon. Maybe twelve-fifteen. That’s about when Denyce arrived. Denyce Graves, says The Kansas City Star, “has belted out grand operas at the Metropolitan Opera and opera houses around the world and has given command performances for presidents and Supreme Court justices….” She was in Kansas City to perform with the Lyric Opera. On Saturday, she chose to explore Kansas City’s connection to jazz. So she visited the Mutual Musicians Foundation. Count Basie jammed here. So did Lester Young, and Mary Lou Williams, and Jo Jones. This was their union hall. Charlie Parker met Dizzy Gillespie upstairs. 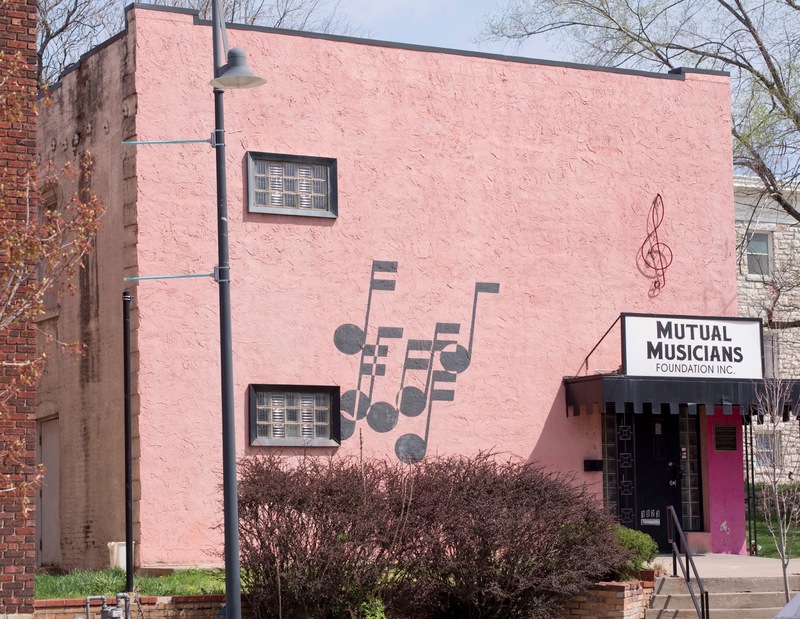 Today the Mutual Musicians Foundation is recognized as a National Historic Landmark for its contributions to American history. Musicians still rehearse here. Weekend jam sessions still last the night. And a day can start with a visit from an internationally renowned Mezzo-Soprano. Downstairs, Denyce greeted guests, graciously introducing herself to every one. 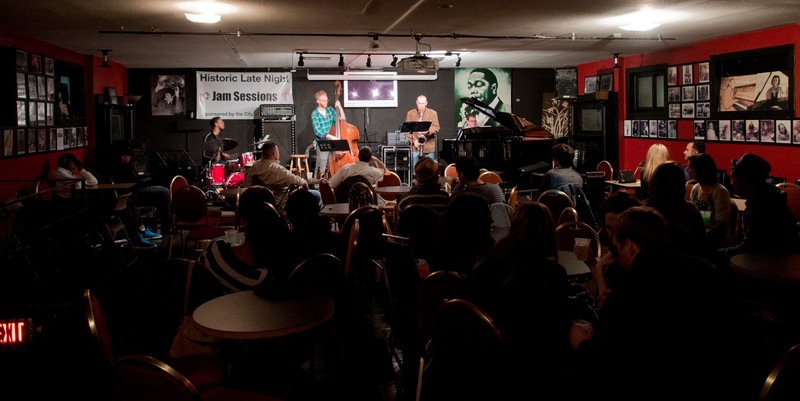 She examined the walls, covered with graphic panels explaining the Foundation’s ties to jazz history. She recognized names, asking about their association with this building. 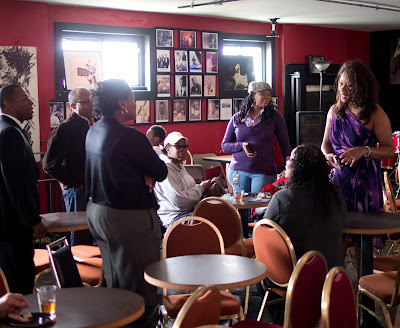 Upstairs, engulfed by photos and portraits of musicians who performed here, Denyce chatted. She was told about youth programs and arranged for the children to be photographed with her during intermission of a Lyric Opera performance. Then, when one young attendee summoned enough courage to take the stage and sing for her, tepidly, Denyce grabbed her phone to record his performance. Shortly after Denyce left, musicians walked upstairs to rehearse. Young musicians. 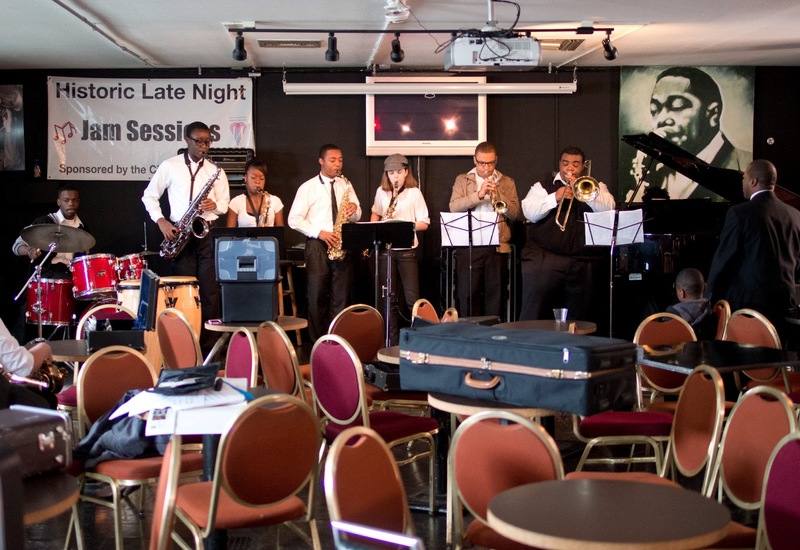 These were the Foundation’s Young Jazz Masters. 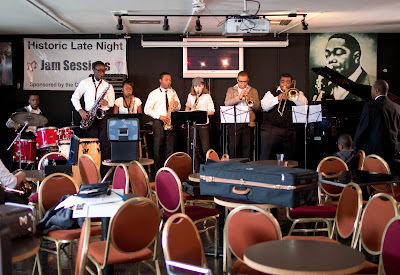 Each Saturday, the Foundation offers free lessons to any student who cares to participate. 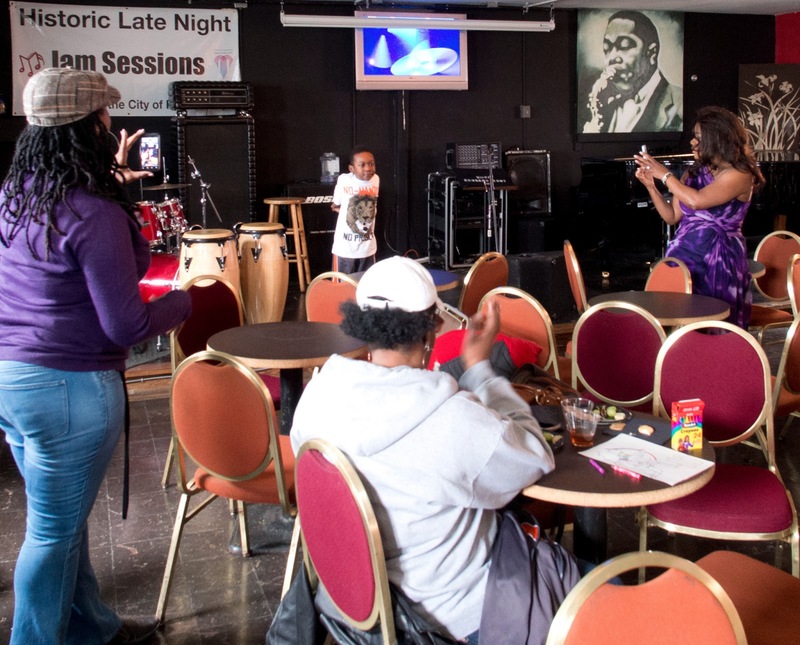 This day, a group was competing in a student festival at the Gem Theater, just down 18th Street. But first they returned to the Foundation’s stage to practice. For more than eighty years, young jazz musicians have practiced here, in this room. Charlie Parker was one. 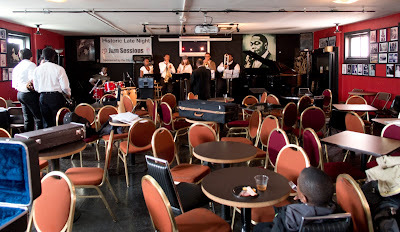 Later, this night, the room will fill with people listening to live jazz. Every chair will be taken by guests who will have paid $10 each to come and party and drink and talk and hear and enjoy. But right now, a future generation is on the stage, practicing. 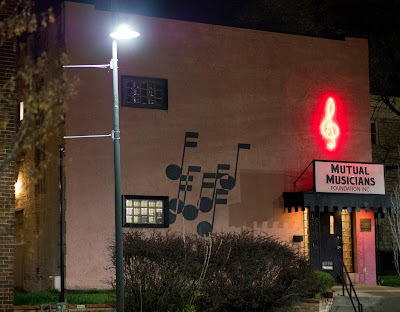 In the Mutual Musicians Foundation, this is how it begins. About 1 a.m., the music starts. The doors open at midnight, but 1:00 is when the jam session starts. It will continue all night, just as it has virtually every weekend night since the early 1930s. Matt Otto commands the stage on sax, with Andrew Ouellette on piano, Ryan Lee on drums and Karl McComas-Reichl on bass. Each one, an outstanding musician playing his best. Other musicians wait in the back of the room to join the jam. These musicians are in their twenties. That’s the age Basie and Lester and Mary Lou and Jo were when they jammed in here. By 2 a.m., the room started to fill. By 3, empty seats were scarce. At 5, the jam concluded. By 6, the crowd cleared and staff – board members – started cleaning up. Somewhere around sunrise, Saturday at the Mutual Musicians Foundation came to a close. I love this place! I still have memories of escaping college life at UMKC with my roommates (all conservatory majors) and staying until the walls nearly caved in with noise and sound. It was a place where it didn't matter what your color was, as long as you had music in your heart you could always get in. - It looks fancier now, we still had the folding metal chairs back then..they worked just the same. Hey i love the first photo of the MMF could i use it for a community mural I'm designing I would give credit it of it of course. Yes, feel free to use the photo.